East Africa’s leading cooking oil manufacture, Bidco is looking for contract farmers to grow and supply soya beans and sunflower. Bidco field officer in charge of small-scale farmers Kevin Nyangun says the company has a deficit of up to 50 per cent. This forces the company to “put the machines to sleep mode” when there is nothing to crash. Soya beans, sunflower and maize are the main raw materials in the manufacturing of liquid cooking oil. Lifestyle diseases like blood pressure are driving market craze for liquid cooking oil because it has minimal cholesterol. “The company signs an off-take contact with farmers. The contract is a commitment from the company that if they deliver the required quality, we have to pay them; pay is cash on delivery-no stories of ‘come tomorrow’,” he said. The deficit is so bad that the company is importing between six and eight metric tonnes of soya beans per year from Uganda. As opposed to maize, which takes about six months to mature, soya and sunflower are ready for harvest after four months. Production of liquid cooking oil from maize in “critically unreliable” because the crop is the country’s staple food for most households, Nyangun said. “If farmers can increase soya beans output to even 20 metric tonnes per year, we can still comfortably handle that because the machines gallop 100 metric tonnes per day!” Nyangun said. Currently, Nakuru-based branch, Elianto, gets about 3,000 metric tonnes per year from Western and Nyanza regions. The two crops do well in most soils and with the help of extension officers from the company, the gap can be closed in. It is not expensive to produce high quality and quantity yields if a farmer follows the instructions of the officers, he says. “A farmer needs about KSh24,000 to produce between 500kgs and 1000kgs of soya per acre-if well managed. 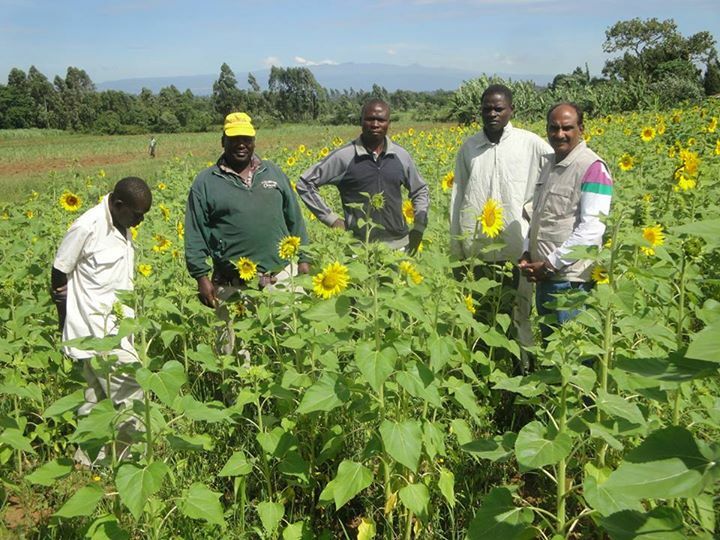 At least KSh12,000 invested in an acre can yield between 300kg and 1,200kg of sunflower,” he said. Soya beans planting seeds cost betwen KSh150 and KSh200 per kilo while sunflower of the same amount can be bought at KSh300. A farmer requires 20kgs for one acre while two kilos of soya beans are sufficient for the same piece of land. Bidco buys soya beans at KSh45 per kilo and KSh33 for same amount of sunflower. Farmers have been shying away from soya beans cultivation because of its low germination percentage. Their viability decreases by 30 per cent after six months, but Bidco links contracted farmers to Kenya Seed Company and other renowned suppliers for best quality seeds that would yield optimum results, good for the company and the farmer. After crushing out the oil, remains of soya and sunflower are ground into animal feeds and other products. Besides the Nakuru branch, Bidco has another plant in Thika, Kiambu County.